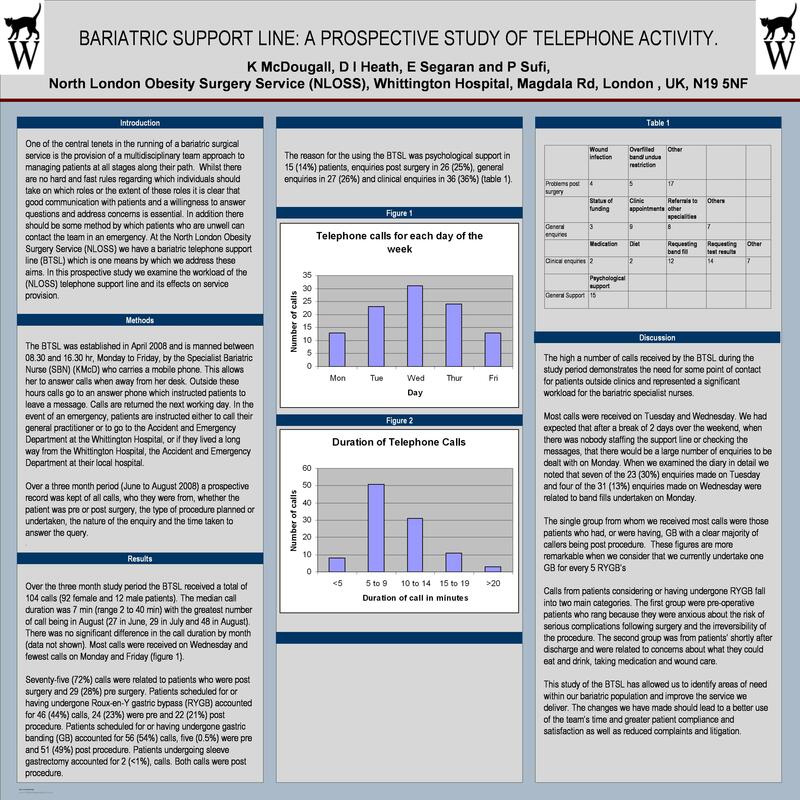 Bariatric Support Line: A Prospective Study of Telephone Activity. It is widely reported that support is a key element affecting patient outcomes following Bariatric surgery. At NLOSS part of this support is through a telephone helpline, which is manned by the Bariatric Nurse Specialist (K McD). In this prospective study we examined the workload of the telephone helpline. The phone line was staffed between08.30 and 16.30 each weekday. Out of hours and at weekends, messages could be left on the answer phone, which were picked up on the next working day. The support line has been running since February 2008. In this study we examined the working of the support line between June and August 2008. All incoming and outgoing calls were logged and the content recorded in a diary. During the study period a total of 104 calls were recorded in the diary (male to female ratio 92:12). The median call duration was between 5 and 9 min (range 2 to 40 min) with the greatest number of call in August (27 in June, 29 in July and 48 in August). There was no significant difference in the call duration by month. Most calls were received on a Wednesday and fewest calls on Monday and Friday.